Developing the foundation for a unit is exhausting and tedious. I love putting together Vocabulary and Notes for my students, but oftentimes the task is overwhelming. 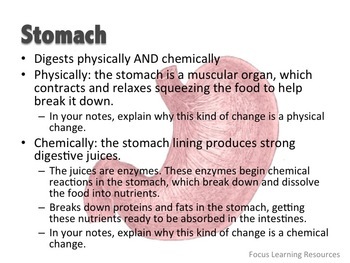 Learning Targets:I can distinguish between physical and chemical changes in matter in the digestive system. I can recognize how large molecules are broken down into smaller molecules, such as carbohydrates can be broken down into sugars. This product provides the foundation for the Digestive System, focusing on Chemical and Physical Changes. 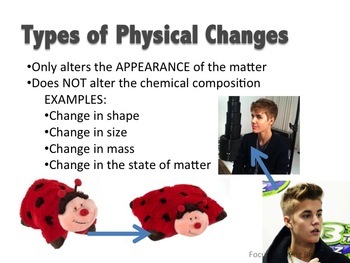 Generally, every week I present my Science vocabulary and notes the same way. The students use the same vocabulary sheet. You can download this free printable at my store. The printable has a place for the students to write the term, write the definition, draw a picture that helps them connect the term to the definition, and then use the term in a sentence. This is an easy grade for you and them! Fill-in-the-blank notes come with this product in the form of a folded booklet that can be hole-punched to be put in a binder OR stabled/taped into an interactive notebook. The fill-in-the blank notes only use ONE PAGE! I have always tried my best to add some interactive elements to the notes where students must respond to questions, draw and color diagrams, and consider the unit on a deeper level. The supplementary notes -- only a HALF page per student! -- are used for these purposes for this unit. If your district is constantly in a “paper crisis” like many districts these days, I have designed the supplementary notes to save paper. Print this sheet front and back and cut right down the middle. 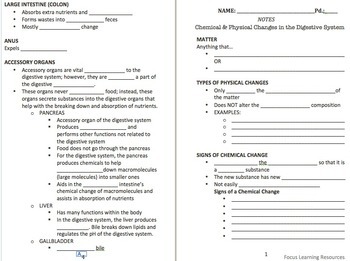 These notes were designed for the 7th grade Science classroom; however, feel free to edit for the purposes of your classroom – whether that means simplifying for your upper elementary or adding to it for your early high school students. 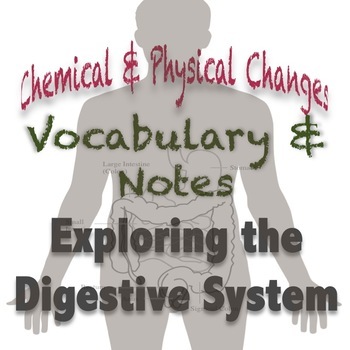 If you are interested in interactive stations for this same unit, click the link below!